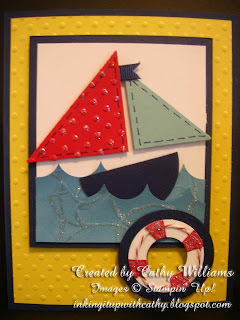 The hostess at a recent workshop challenged me to come up with a card using Stampin' Up! 's punches in a way other than what they were designed for. I CASE'd this card from a gal on SCS. I thought it was a cute card for a little boy's birthday or even a great card to welcome a new little baby boy. So sweet! Colors used are: Marina Mist, Daffodil Delight, Night of Navy, Baja Breeze, Real Red and Whisper White. I used one of the Texturz Plates on the water and the Perfect Polka Dots embossing folder on the sail and the background.